Sicuramente una delle piccole/grandi rivoluzioni dell'anno e' l'avvento per produttori, musicisti e DJs con velleita' produttive, del nuovo sistema audio digitale messo a punto dalla statunitense Mark of the Unicorn, rispondente al nome di mk3-2408 e relativa scheda computer PCI-424. Si lavora a 24-bit con frequenza di campionamento 96kHz vale a dire, con linguaggio semplicistico, un secondo di suono spezzettato in 96 mila punti. Grazie ai converetitori davvero High quality che fornisce un produttore giapponese e che sono praticamente identici per altri superclienti quali Digidesign e Apogee, il nuovo sistema di Motu e' da considerarsi in linea relativamente a qualita' di conversione, gamma dinamica e rapporto rumore. MK3 lavora ovviamente con Mac e con PC anche se ogni professionista tende a privilegiare Mac per obiettivi e concreti motivi di affidabilita' e potenza. Personalmente lancerei dalla finestra ogni PC , ma il problema e' che non possiedo alcun PC. Quindi .... un buon G4 Mac OSX, questo nuovo sistema Motu, un Logic Platinum, un Logic ESX24 mkII, una interfaccia Midi del tipo MT8, una tastiera esterna del tipo Triton, qualche rack synth (Access, Novation, Waldorf, NordLead, Roland etc. ...), ulteriori synth virtuali, un pre-amp per microfono, un buon CDR master del tipo Sony CDR-W66 e, conto in banca permettendolo, una torre di hard-disks). MK3, a parte le porte Adat/Tascam, offre 8 ingressi e 8 uscite analogiche che vanno considerate sufficienti visto che il brano , specialmente se di 'tendenza' o 'avanguardia', va costruito come si suol dire, "tutto dentro", ed MK3 consente, all'interno, di lavorare su tracce limitate solo dalla potenza degli HD e dalla flessibilita' del software. Il master del brano uscira' rigorosamente dalla porta digitale della MK3 per entrare nel digital In del CDR o del Dat. Chi volesse piu' ingressi in tempo reale o differito puo' aggiungere altri MK3. Abbiamo installato MK3 in uno dei nostri Mac G4 ... il risultato e' notevole e ancor piu' notevole e' il prezzo con cui MK3 viene fornito al pubblico ... milletrecento euro per 24-bit ... veri. Aggiungete quasi obbligatoriamente programmi Logic o Digital Performer e andate a caccia di plug-ins ... il brano e' gia' pronto. Le impressioni dell'engineer Carlo Sferco relative a Motu 2408 mk3. The 2408mk3 upgrades the 2408 with many improvements including 96kHz support, SMPTE synchronization, support for four interfaces and a 96-channel DSP-driven monitor mixer. 8 analog inputs/outputs with 24-bit, 96kHz converters on balanced/unbalanced 1/4" TRS jacks. Three banks of ADAT optical provide 24 channels of ADAT optical input/output at 44.1/48kHz (12 channels at 88.2/96kHz). Three banks of Tascam TDIF provide 24 channels of TDIF (Tascam digital) input/output (12 channels at 88.2/96kHz). Provides stand-alone format conversion; transfer any format to any other, up to 24 channels at a time. Drivers for Mac and PC; 24 simultaneous inputs/outputs for all popular Macintosh and Windows audio software (ASIO/WDM/GSIF/MAS/Sound Manager). CueMix DSP: this on-board mixing and monitoring matrix allows you to mix up to 96 channels of 96kHz audio with the same near-zero latency as today's latest digital mixers and no processor load. Includes AudioDesk full-featured, sample-accurate workstation software for MacOS 9 with recording, editing, mixing, real-time 32-bit effects processing and sample-accurate sync. Provides word clock and ADAT Sync: achieves sample-accurate digital transfers between digital tape decks and the computer. The 2408mk3 provides 8 channels of 96kHz analog recording and playback, combined with 24 channels of ADAT and Tascam digital I/O. Up to four interfaces can be connected to the included PCI-424 card for an expanded system capable of 96 simultaneous active input and output connections at 96kHz. The 2408mk3 is ideal for both the computer-based studio with no mixing board and more elaborate studios built around a digital mixer of any size. For the computer-based studio, the included PCI-424 card features CueMix DSP, a flexible DSP-driven mixing and monitoring matrix that eliminates the need for an external mixer or patch-bay. You can connect all of your studio gear, including synths, keyboards, effects processors. and control it all from your desktop with no audible monitoring latency and no processor drain on your computer. With 24 channels of digital I/O, the 2408 can connect your computer to a digital mixer. Both ADAT lightpipe and Tascam TDIF digital connections are supported at any sample rate up to 96kHz. Also available video and SMPTE synchronization to slave your entire workstation directly to video or SMPTE time code with sub-frame accuracy without a dedicated synchronizer. The 2408mk3 provides cross-platform compatibility with Macintosh, Windows 98SE/Me/2K/XP and most of audio software and host-based effects via WDM/ASIO/Sound Manager drivers. 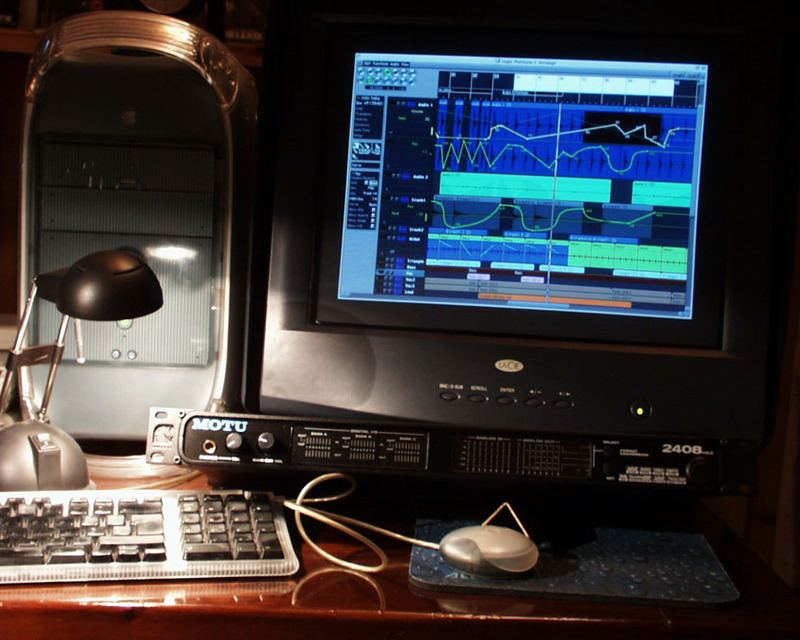 Or you can use the included AudioDesk workstation software for Macintosh, with 24-bit recording/editing and 32-bit mixing/processing/mastering. The 1U rack-mountable 2408mk3 provides seven banks of I/O: one bank of 24-bit, 96kHz analog on balanced TRS connectors, three banks of 96kHz ADAT optical, three banks of 96kHz Tascam TDIF, plus stereo S/PDIF. You can choose any three banks(up to 24 channels) to be active at one time. This means you can hook up three ADATs, three DA-88s, and eight analog devices all at the same time and access any three banks in any combination of formats. And you can freely switch formats at any time. In addition to the eight dedicated analog outputs, the 2408mk3 also features a stereo output with front panel volume control so you can plug powered monitors directly into the 2408mk3. The PCI-424 card included with 2408mk3 core systems is fully compatible with legacy MOTU interfaces originally designed for the PCI-324 card. You can connect any MOTU PCI interface, including the 2408, 2408mkII, 1296, 1224, 24i, and 308, mix and match new and legacy interfaces as you like. A core 2408mk3 system provides 24 inputs and outputs, but it also offers expansion in the single PCI card. Up to four interfaces can be connected to the PCI-424 for up to 96 channels of simultaneous input and output at sample rates up to 96kHz. ... You could connect 12 ADATs and 12 DA-88s to your computer, along with 32 channels of analog I/O, and simultaneously record and play as many tracks of audio as your computer allows. If you have a digital mixer, the 2408mk3 provides up to 96 channels of digital I/O at 44.1 or 48kHz, and 48 channels at 88.2 or 96kHz. The 2408mk3 provides S/PDIF digital I/O so that you can exchange digital audio with a wide variety of other devices via this industry standard format. But the 2408mk3 takes S/PDIF one step further than most other systems by providing an extra S/PDIF stereo output of the main mix. You can use this extra stereo digital output for whatever you want. For example, you can leave it connected to a DAT machine so that at any time you can record a stereo mix of the project you are working on - without having to swap cables with another S/PDIF device that may be connected. The 2408mk3 also operates as a stand-alone audio format converter. You can convert audio from any one of its formats to any other, in banks of 8 channels. For example, if you connect three Alesis recorders and three Tascam recorders, you can digitally transfer 24 channels from one format to the other in one pass. If you expand your 2408mk3 system to four 2408mk3 I/O rack units, you can simultaneously connect 96 channels of ADAT optical, 96 channels of Tascam TDIF, and then transfer 96 channels of material in a single pass. The 2408mk3 can integrate 24 channels of digital I/O with a single unit. For example, the Yamaha DM2000 provides an automated moving fader interface, additional real time digital audio effects, mic preamps and DSP power. Connect the DM2000 to your 2408mk3, and now you have 24 channels of digital I/O between the mixer and your computer. If you need more channels, you can add additional 2408mk3 interfaces to support digital transfers as large as 96 channels at 48kHz or 48 channels at 96kHz. The 2408mk3 is a bridge between your digital mixer and your computer audio workstation, and it supports both the ADAT optical lightpipe format and Tascam's TDIF format. stand-alone director movie that helps you connect everything together. The 2408mk3 provides on-board video and SMPTE time code synchronization features. These features allow you to slave your 2408mk3 system to video, SMPTE time code or both, without a dedicated synchronizer. The PCI-424 card provides a DSP-driven phase-lock engine with sophisticated filtering that provides fast lockup times and sub-frame accuracy. 2408mk3 interface also provides a dedicated RCA timecode input and output, but with the PCI-424 on-board DSP, any analog input can be a SMPTE input and time code can be sent to any output (analog or digital). The included software also provides a complete set of tools to generate SMPTE for striping, regenerating or slaving to other devices to your computer. Like Cuemix DSP, the synchronization features are cross-platform and compatible with your favorite audio sequencer software. The PCI-424 card features a powerful DSP chip dedicated to creating a custom monitor mix of up to 96 channels of 96kHz audio. Because the mixing takes place on the card itself, instead of making the round trip from the PCI bus to the host processor, the system provides the same near-zero latency performance as today's latest digital mixers. CueMix DSP eliminates the buffer latency associated with monitoring on host-based systems. And your computer's CPU is free for other tasks. Cuemix DSP is flexible, and allow you to mix multiple channels into multiple mix busses or directly assigned outputs. Cuemix console now provides independent level and pan controls for each input on every mix. Also, CuemixDSP does not limit you to four stereo mixes. You can configure a unique mix for every physical stereo output you have available. This means you can have up to 48 separate stereo mixes on a 96 output system. Any MOTU Audiowire interface plugged into the PCI-424, including the original 2408, can take advantage of Cuemix's flexible monitoring. Can I use Cuemix DSP for effects processing? No. CueMix DSP is dedicated to monitor mixing. Host-based effects such as those included with Digital Performer are designed to run on your computer's CPU. However, Cuemix DSP allows you to integrate external effects processors with the same near-zero latency performance as a dedicated digital mixer. You can also combine Cuemix DSP monitoring with signals processed by host-based effects. Can I use my original 2408 with the PCI-424 card included with the 2408mk3 core system? Can I buy a 2408mk3 expander to use with my PCI-324 card? No, the 2408mk3 only works with the latest generation design of the PCI-424. Can I use the digital I/O on the 2408mk3 with my 96kHz digital mixer? Yes. The 2408mk3 supports the TDIF and lightpipe 96kHz standards which halve the number of channels in order to accommodate the additional bandwidth. Therefore, a 2408mk3 supports up to 12 channels of 96kHz digital audio over TDIF and lightpipe. Can I still use my MTP-AV or Digital Timepiece with the PCI-424? Yes, use the sample accurate ADAT sync connector on the PCI-424. What operating systems are supported by the 2408mk3? Will the 2408mk3 support OS X? Yes, OS X drivers for the 2408mk3 are in development. You'll be able to download OS X drivers from the MOTU web site.